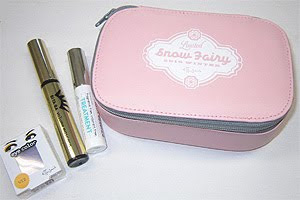 For this holiday season, Ettusais will release a Snow Fairy Coffret (4035yen) on 4 November in Japan. It includes their popular Bitaba Volume mascara, eyelash essence, an eye color (of one's choice) and a pouch. And for warding off chapped lips in the dry winter season, there will be a limited edition Lip Essence Deep Moist SPF18 PA++ (1260yen, 8g). Pics from Biteki and Cosme.net.